Just sharing a quick and easy wedding design I created earlier this year during my time on the Dirty Dozen over at Splitcoaststampers. Used the stencil monoprint technique with three shades of Distress Inks and my ARTplorations Old Rose Prints to create the background. Added a bit more sponging in all three colors and then added some water droplets. When that was dry I stamped the image and sentiment from STAMPlorations Newlyweds and then painted the bride’s dress with H20s. 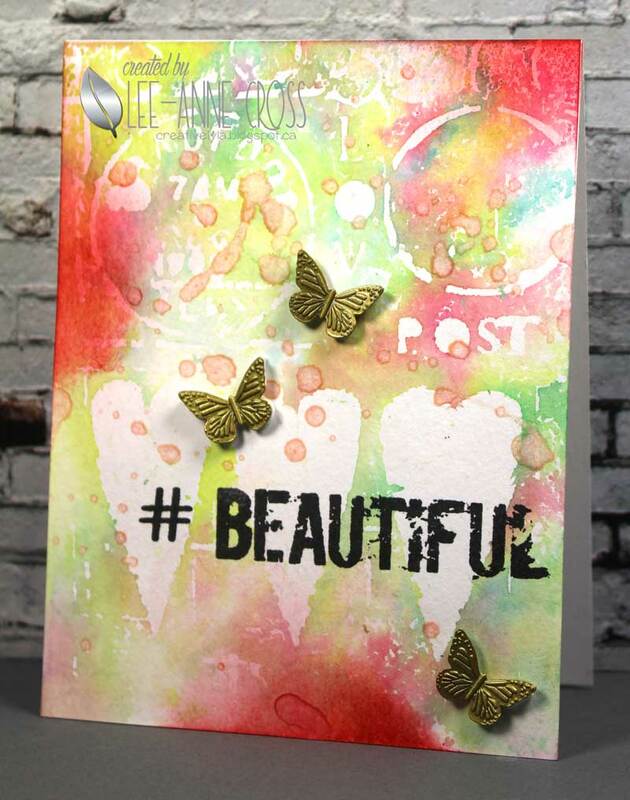 I’m sharing a card I recently made for the Hope You Can Cling To Challenges at Splitcoaststampers. It’s an annual card drive where stampers/card artists make cards to send to the UT MD Anderson Cancer Center in Houston. This is the sixth year for the card drive. 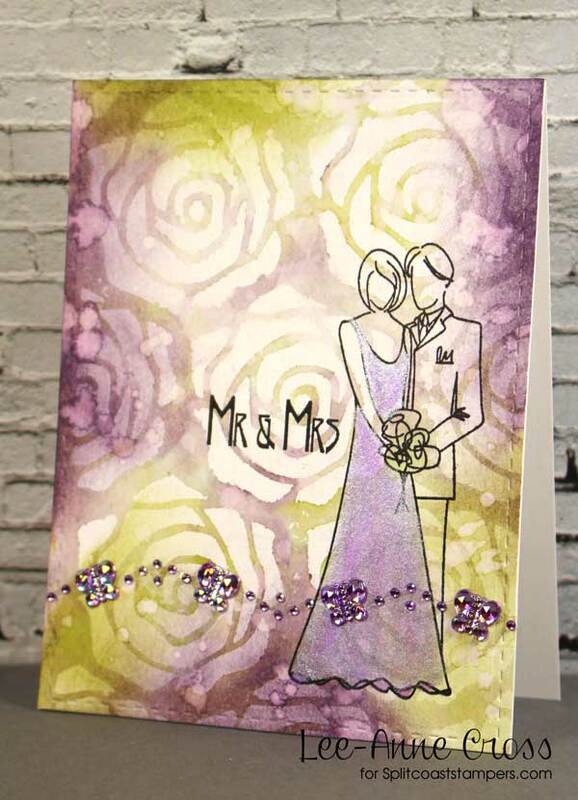 This is one of my favorite techniques to add color to a card. I’ve used the stencil monoprint technique. I’ve inked up my stencil with three shades of Distress Ink and misted the stencil before placing it on my watercolor paper. Then I added some droplets of Prima Color Bloom before sponging on a bit more color. Hope you are having a wonderful weekend, everyone! Just popping by with a quick post. This was another of my Splitcoaststampers Dirty Dozen designs from earlier in the year. So simple and so easy to do. 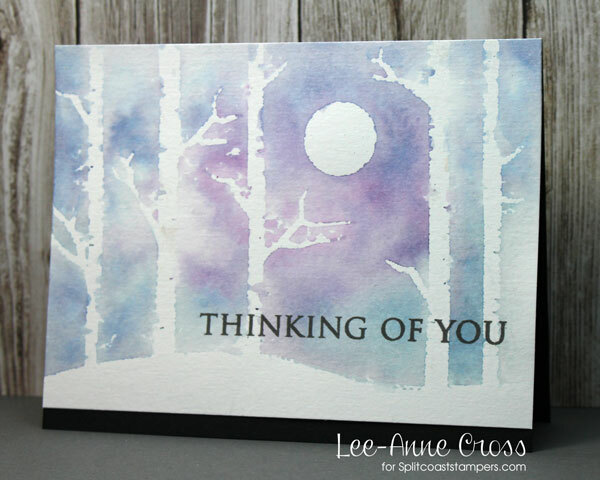 Just inked up my Hero Arts Forest stencil with three shades of Distress Inks, taking care to put most of the purple shade around the moon. Spritzed it with water and dried it. Easy right? My colored panel has been made using the stencil monoprint technique. My Splitcoaststampers tutorial for this technique can be found right here. Once that was dry, I sponged more ink around the edges of the panel. 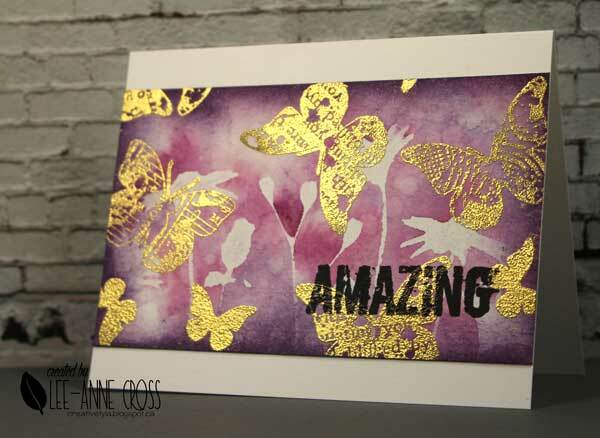 Then I stamped several different butterflies in gold ink and also heat embossed them in gold. 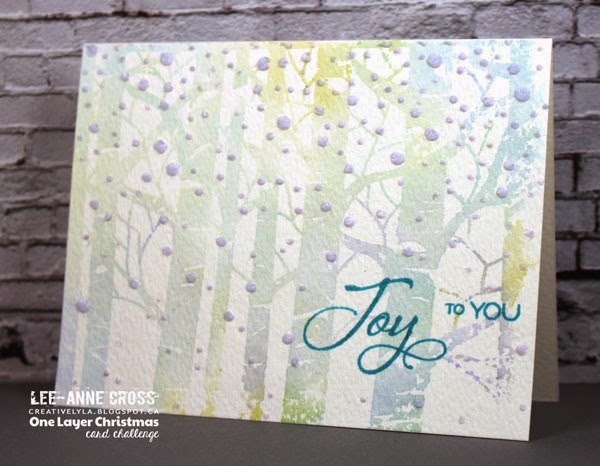 Just a quick reminder; there’s still time to get your card in for the One Layer Christmas card challenge! My background has been made using a stencil monoprint technique. If you are interested in learning this technique you’ll find my step out and video tutorials here. I’ve inked a stencil with three different shades of Distress Inks, misted it with water and pressed it onto my watercolor cardstock. Then I used another shade of Distress Ink with a different stencil over top of it. Next, I flicked some water onto the cardstock to add a little more dimension. 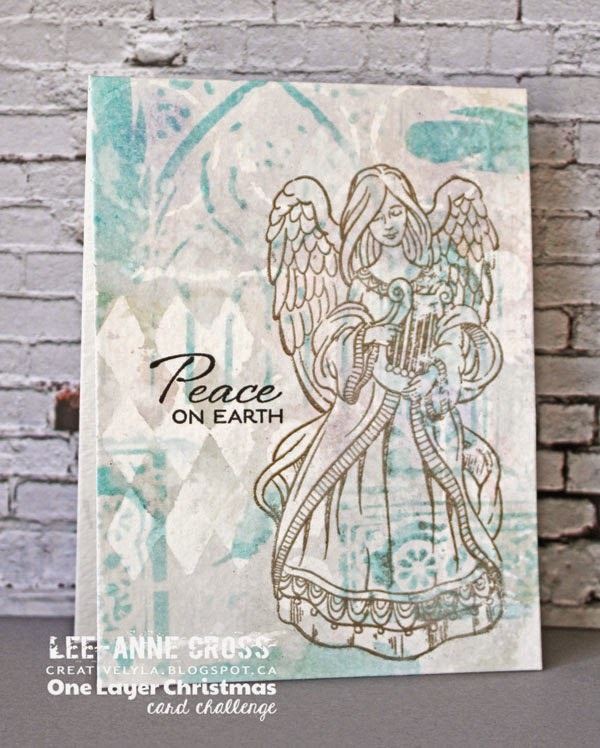 Check out the beautiful inspiration from the rest of the Design Team right here. All the challenges are “anything goes”, and require a one layer design. And, the optional twist with this challenge is “trees”. Using the optional twist will get you an entry into the monthly random drawing. Every card that you enter with the twist = 1 entry into the drawing and you can enter as many times as you’d like! You can check out the rest of the Design Team’s amazing designs right here.